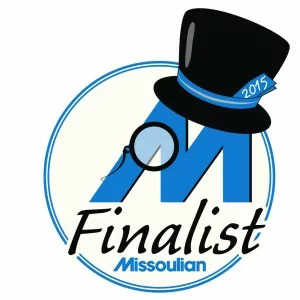 Missoula dentist Dr. Brett Felton and the great team at Felton Dental Care work closely with our patients to develop the best denture solutions for their unique needs and circumstances. We understand that getting dentures can be a traumatic event for some and show that understanding through compassionate care and attention. However, we do emphasize that part of our job when crafting a custom denture solution for our patients is making sure they are set up for success and can live life fully without fear of limited dental functionality. Dentures are false teeth used to replace natural teeth due to damage, disease or wear. Dr. Felton has invested in the technology and training to provide Missoula residents with the best denture solutions available. You need not worry about old “wood” dentures legendarily attributed to George Washington that fall out while eating. Modern dental composites and processes create beautiful, natural looking teeth that allow you to smile and laugh with confidence. All-in-all, your denture experience will be much more enjoyable than those of the past and in fact, you may not even notice you are wearing dentures at all! 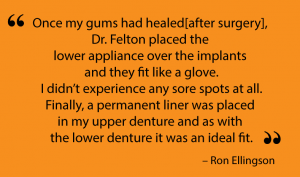 Dr. Felton also offers dental implant supported dentures, which truly are a revolutionary step in the field of dentures. Dental implants are placed and allowed to set up in your mouth, becoming strong like the natural tooth roots that were there before. When the implants have stabilized and are ready, dentures are affixed or mounted to these dental implants. The result is permanently attached, implant-supported dentures that look and function like your natural teeth. For those who are viable candidates for dental implant supported dentures, their dentures will be a surprisingly pleasant solution and give them the proverbial “new lease on life”, allowing them to not have to worry about their smile, but to share it confidently with friends, family and acquaintances. Call, text, or contact us using the form below to schedule a visit. Dr. Brett Felton can help find the best denture solution for you.